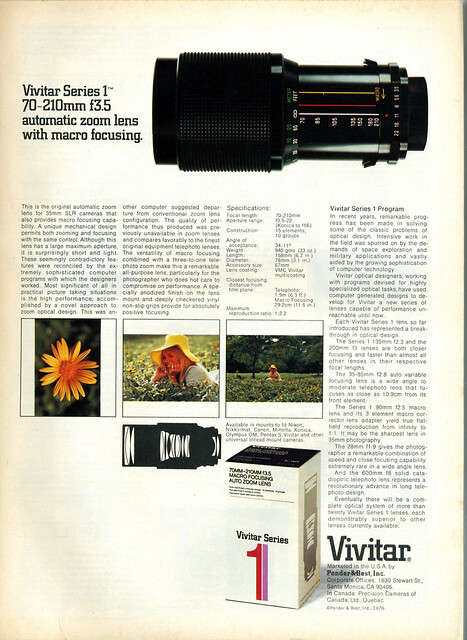 The Vivitar Series 1 70-210mm f/3.5 VMC Macro Focusing Zoom lens was designed for and marketed by Ponder & Best (later Vivitar) in the 1970s. 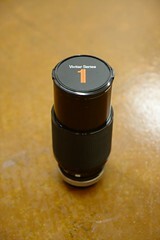 It was the first Vivitar Series 1 lens and was considered revolutionary for its time. 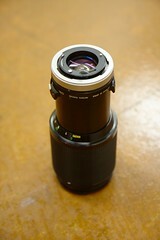 Among other innovations, it is notable as the first macro focusing zoom lens. Its patented ability to switch into macro mode was eventually adopted by nearly every major camera and lens manufacturer in the world. 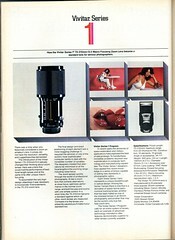 Vivitar's specifications were turned into a lens design by optical engineer Ellis Betensky of Stamford, CT. Betensky had developed an early auto-optimizing optical design program that he ran on a mainframe computer owned by Perkin Elmer. 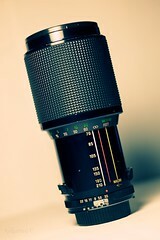 Betensky's design was then manufactured by Kino Precision. U.S Patent number 3,817,600 was granted in 1974 for the invention of a Zoom lens having close-focusing mode of operation. The patent lists Rinzo Wantanabe of Tokyo, Japan (probably Rénzow Watanabe of Kino Precision), and Ellis I. Betensky of Stamford, CT as the inventors. ...the designers of Vivitar's new Series 1 lenses have come up with the closest approach to my dream lens yet: a sharp (I wouldn't say ultrasharp), reasonable-sized, 70 to 210-mm f/3.5 zoom telephoto that focuses down to about three inches...though I've been reluctant to use zooms before (I've found them awkward and unsharp), I took to this one like a duck to water. Available since mid-1973, the 70-210mm f3.5, [the] first macro-focusing automatic zoom lens for 35mm single-lens reflex cameras, delivers impressively high performance throughout its focal-length and focusing ranges, comparing favorably with top-drawer nonzoom telephoto and macro lenses. We first reported its existence in Feb. 1972, did an extensive coverage of its practical general applications in March 1973 and analyzed and compared its macro abilities as recently as May 1974. In 1972 we examined a prototype. 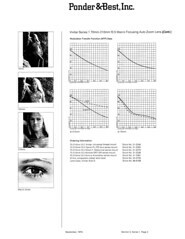 In 1973 and even as late as May 1974, the lenses we reported on were evolutionary and not final. The growing pains of a lens which was optically computed by Ellis I. Betensky of Opcon Associates in Stamford, Conn., and then mechanically optimized and prepared for manufacture by Rénzow Watanabe of the engineering division of Kino Precision Industries, Ltd (Japanese manufacturer of the lenses for Vivitar) were considerable. 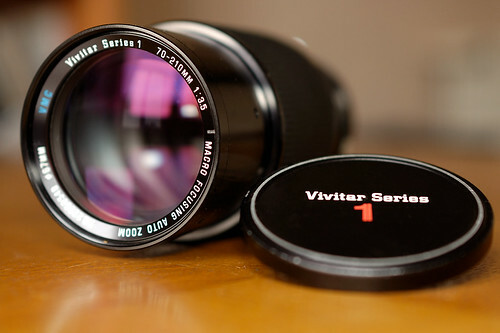 While this is the original and most well-known Vivitar Series 1 70-210mm lens, it was eventually replaced with other 70-210mm lenses with varying specifications, produced by several different manufacturers. 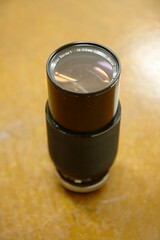 Version 1 (1974-1978, sn 224xxxxx - 227xxxxx) - This was the initial production version of the lens. It was soon discovered that there were reliability issues which Vivitar attempted to address through a series of minor changes. These changes were undocumented even in Vivitar service publications, with one exception - an "improved helicoid assembly" was introduced starting with sn 22528001 according to the service manual. However, all changes were designed to be backwardly compatible with the version 1 design. 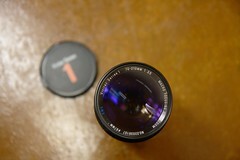 All version 1 lenses should be more or less interchangeable from a service perspective. 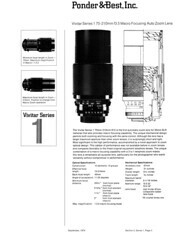 Version 2 (1978-1981, sn 228xxxx - 221xxxxx) - In late 1978 Vivitar attempted to solve the reliability problems by introducing a major internal redesign of the lens known as the Z71 modification. Pre 1978 and post 1978 models are no longer completely interchangeable. 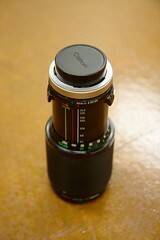 The Version 2 redesign also introduced several additional mounts. Because of the redesign, Vivitar's internal stock numbers for lens changed (see stock number listings below). This page was last edited on 7 July 2017, at 17:10.